We arrived in Samoa with no plans whatsoever. I didn't take us long to get tangled in with a local farm-owner; Floris. We quickly agreed to do some work at her cacao plantage in exchange for food and shelter. 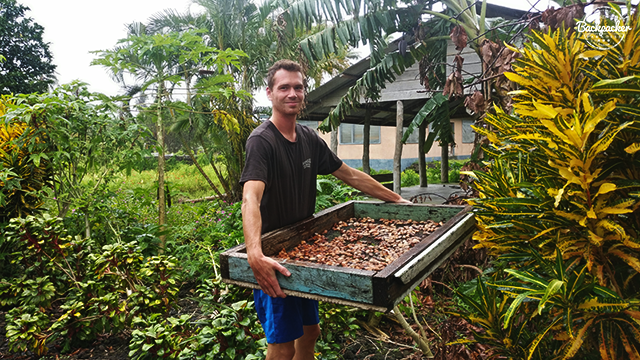 Samoa is famous for cacao and at Floris' farm everything is organic (one of the few organic farms in Samoa). She often takes in woofers (foreign workers) to help out at the plantation. And both Lasse and I were glad to get a break from sightseeing and just get up early in the morning and go to work. 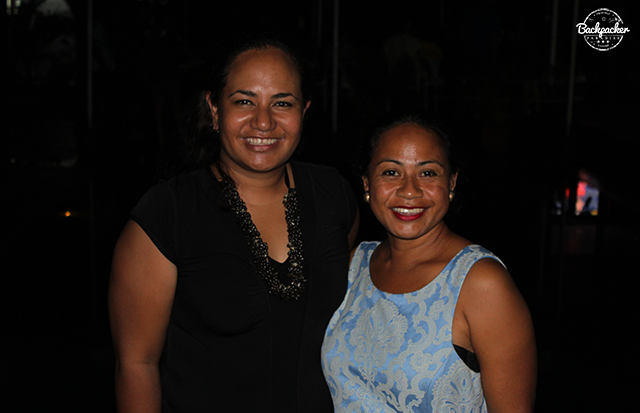 Floris and her friend Fryzna showed us the local side of Samoa and we got a deeper look into the culture and politics surrounding farming in Samoa. We had many interesting talks about the obstacles to overcome as a business owner in Samoa, about the corrupt political system, which still relies on ancient values. Their incredible hospitality painted our first impression of Samoans. This kind of travel experience is not something you can buy at a travel agency. It just happens as you're making your way across countries and continents. We did get to spend some time in the capital city; Apia, on several occasions. 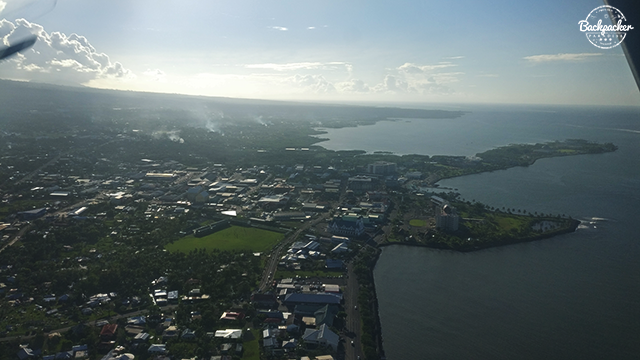 Apia is not only the largest city in Samoa, it's also the only city in Samoa. The other districts in Samoa are categorized as villages. Originally Apia was also a village with a population of just 304. The population today is just under 40k. 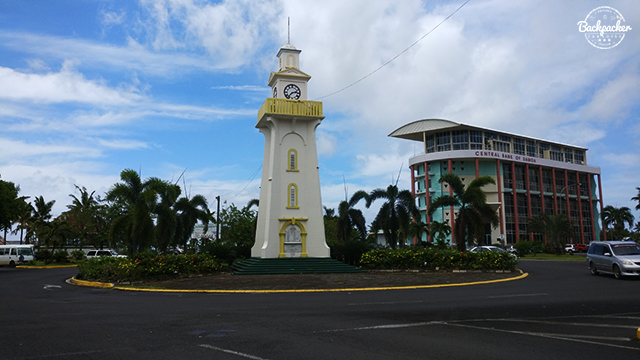 One of the main landmarks in Apia is the Town Clock Tower. A very basic clock tower in the middle of a roundabout. Remember, you're on an island in the middle of the pacific..
Close by you can shop at Taufusi Market, which is practically open 24/7, as the vendors tend to live here. 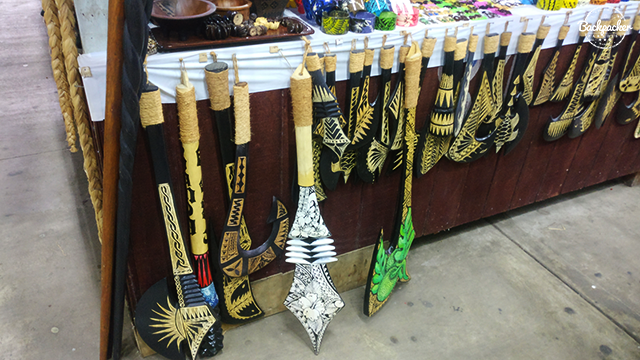 Local wood carvings, scarfs, magnets, jewelry and much more are available. One of the more prominent buildings in Apia belongs to the Mormon Church. 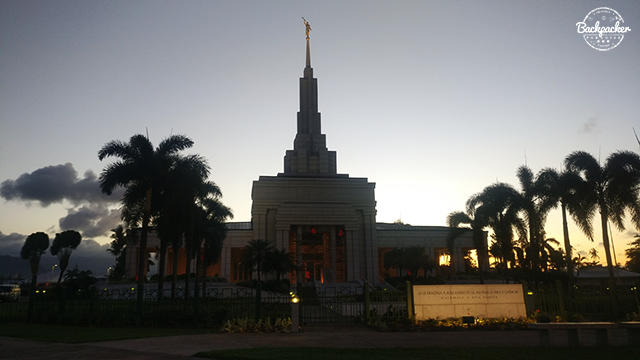 The Church of Jesus Christ of Latter-day Saints is located in the western suburbs of Apia and stands out with its raised spear with a golden statue on top. We did find some time to have a look around the island as well. There's a road which crosses the island by splitting it in half. It called (you've guessed it...) Cross Island Road! On Cross Island Road there's a large complex which was gifted to famous writer Robert Louis Stevenson (most well-known for his bestseller Treasure Island). 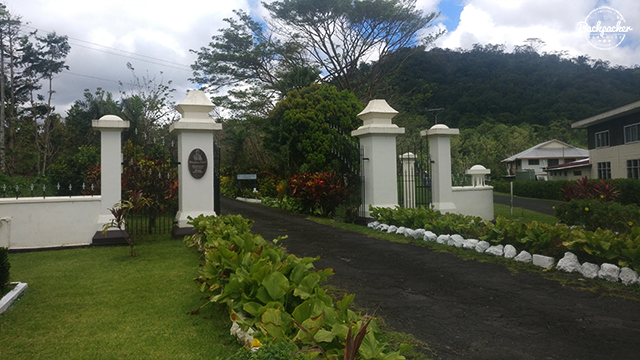 Today, the complex functions as a museum and tribute to the writer, who was official named a friend of Samoa for his help to stabilize and built the Samoan society. The locals call him Tusitala (meaing Writer of Tales). 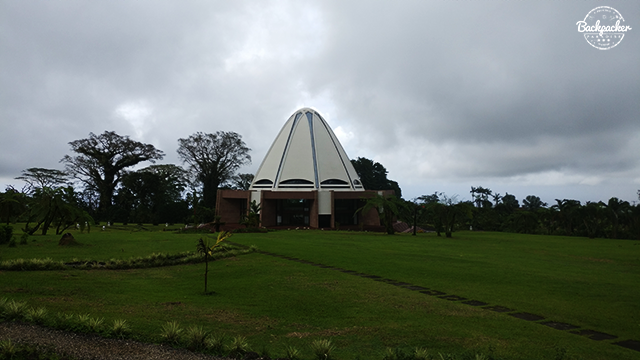 A bit further inland on the Cross Island Road lies the Baha'i House of Worship. One of only eight in the world the house (or temple) is a place of prayer and meditation open to people of all backgrounds. The temple has nine symmetrical sides, which makes it a architectural beauty. 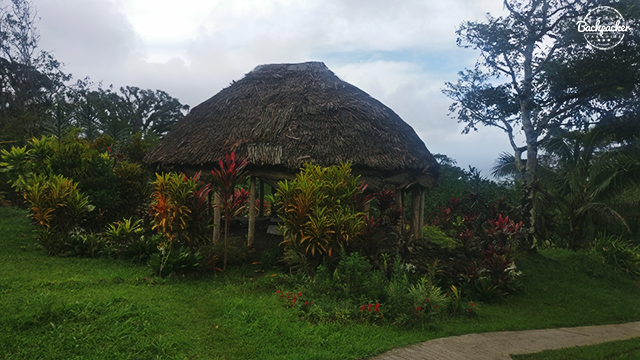 Very close to the Baha'i Temple you'll have a chance to see a traditionally built fale (a circular hut). The fale has been built by hand at Tiapapata Art Centre. Makes sure you visit their workshop and gallery as well. 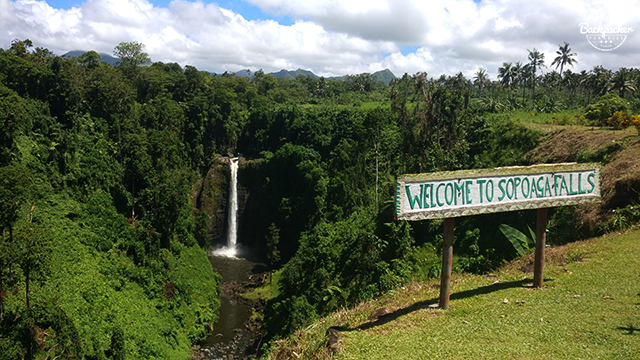 After crossing the island from north to south, you've now reach one of the most beautiful parts of the Upolu island in Samoa. 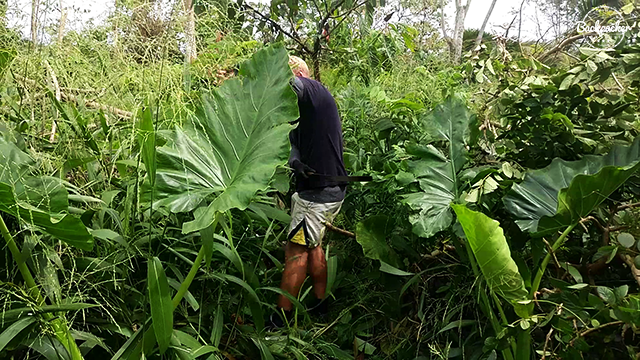 We visited a local farm there, where we cooked (and enjoyed) traditional Samoan recipes. 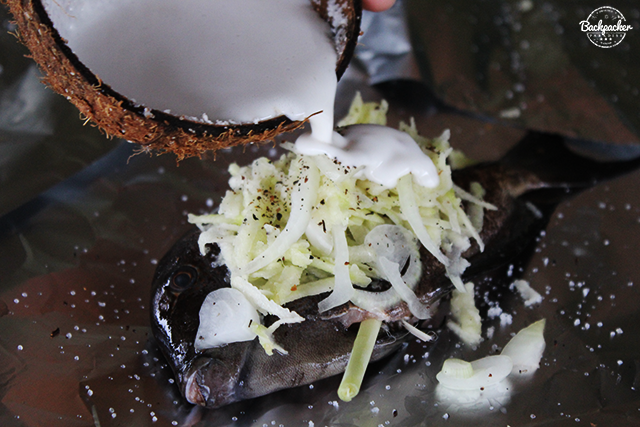 Coconut is a a very important ingredient and cooking over a campfire is obligatory. The agriculture of Samoa is quite intense and very important for the daily life on these pacific islands. Many villagers need a farm to feed their families. Sopo'aga Falls is a beautiful water fall with an easily accessable view point from the main road (5 WST entry). It is only possible to hike to the bottom of the water fall through private land. But the view point is definitely worth the visit. 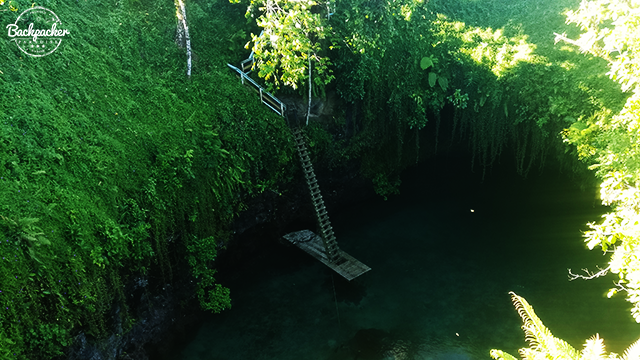 To-Sua Ocean Trench. The crown jewel of Upolu. This place as been trending in travel magazines and on travel blogs recently and with good reason. The naturally created trench has a water flow from the ocean, bringing crystal clear saltwater into the closed off cave. A very steep ladder has been placed by the owner who are now making profit from the entry free of 20 WST per person. We arrived first thing in the morning and had the whole place to ourselves for a couple of hours before the tour busses began to roll in. A natural beauty, which I was told by locals not to miss. Now I can tell you; don't miss it! 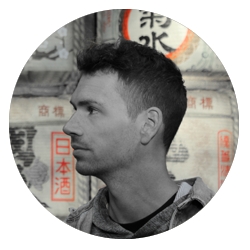 Thanks Alexander for the write up. Samoa appreciates it.